Want to know if a cathedral length veil is a good option (or even an option) for your wedding? Check out our list and weigh the pros and cons of this particular style, find out why so many brides are choosing it, and decide if it’s right for you. Back in the day, a wedding veil symbolized purity and protection. This stylish fashion has been worn by brides since Roman times and has been customized in every era. From long lace masterpieces to short little blushers, the veil is a crucial part of the bride’s ensemble. A cathedral veil has a time-honored history and gets its name from—you guessed it—the length that brides wear for religious weddings in cathedrals. Modern brides are wearing this look indoors and outside. Cathedral veils have recently stolen the spotlight as featured in celebrity weddings. High-profile brides in 2014 popularized this gorgeous length with extravagant, romantic, and elegant ensembles that accentuated each woman’s beauty with a unique—and very long—veil.You can take this fashion and make it your own by selecting a cathedral veil that complements your gown and expresses your personality. If you’re wearing a short dress for your ceremony, don’t wear a cathedral veil. Shorter veils such as French net, shoulder, and elbow designs are best for gowns that hit at the ankle or knee. Cathedral veils beautifully complement any formal ensemble: mermaid dresses, fit and flare silhouettes, ball gowns, and even sheath dresses. You can choose a wide veil for added drama; multiple layers for soft romance; a narrow veil for a sleek appearance; a flat mantilla for traditional beauty; or a foldover for simple elegance. 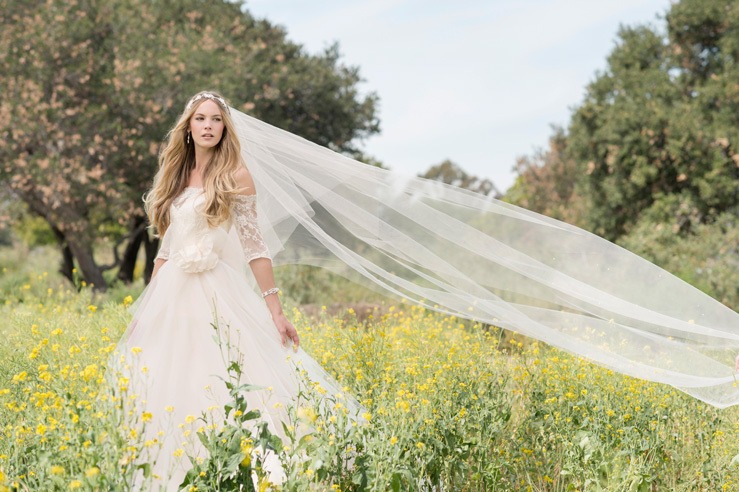 A cathedral veil transforms your wedding look with magical romance. 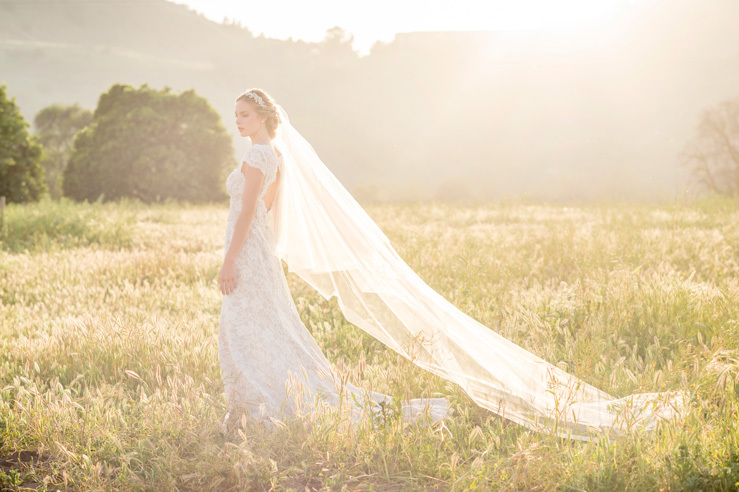 From your walk to the altar to portrait photos, the dramatic beauty of a long veil will enhance your wedding in ways that only you will ever know. Some couples do a first look—others take fun photos with friends, style gorgeous still-life shots, or take private boudoir photos. Many women don’t feel like a bride until they put on their veil. Imagine a veil so beautiful and dramatic that you can’t stop staring until it is literally tucked into your hair. Romantic? We think so.